Driving in a metropolis can be exhausting and you never know when an unexpected jam stretches your minutes-long journey into hours. In fact, Ola says that an average trip in its cabs lasts almost 55 minutes. While this hour-long period can be boring and dreary, the cab company now plans to change this by engaging riders with the help of in-cabin screens. 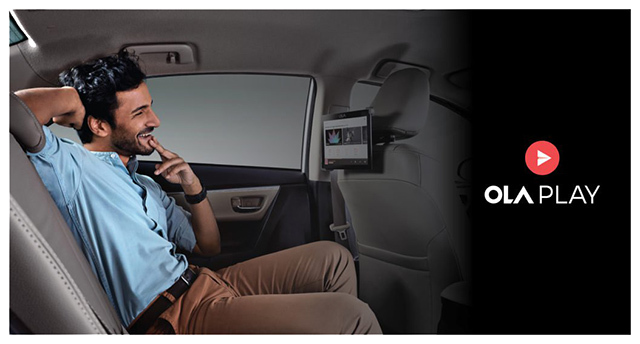 In an interview with Indian Express, Ankit Jain, vice-president and head of Ola Play explains said Ola plans a wider rollout of its in-car entertainment service and plans to revamp it as a subscription service. It’s not about entertaining contextual content either, but the company also plans to use this service to display contextual ads. The company says it will extend Ola Play to all of its 8 lakh odd cabs in India and is retrofitting vehicles with newer screens for enhanced experience. Ola claims even drivers will benefit from Ola Play, which would inform idle drivers about service cycles or a malfunction in their vehicle. More than anything, the emphasis is on making your viewing experience customizable. For example, Ola wants users to resume watching a TV show or movie from wherever they last left it during a previous ride. All of this would be possible through a single sign-in and the Ola Play device will automatically identify the user’s preferences and last activity based on the trip information. Ola is now showcasing a new feature at CES 2018 in alliance with Microsoft that will allow business users to access Microsoft Office 365 applications directly on the screen inside the cab. The company is actively seeking other partners to develop apps for their integrated platform. Advertising is another major prospect that Ola is looking at as it seeks advertisers for the platform. It plans to rely heavily on contextual ads, and don’t be surprised if you’re able to buy products directly from Ola Play in near future. Ola also plans to cash in on physical billboards on the way and show users a related ad beforehand to generate their interest as the cab approaches the signage. These plans along with Ola Money have the potential to make ride-hailing with Ola a unified and cashless experience. It plans to make it a go-to entertainment and productivity system for self-driven vehicles in not just India but abroad. The company is also willing to extend Ola Play to other ride-sharing services like Meru and Uber but that vision could take some time to realize.